A few months back I blogged about the release of IronPython v1.0. IronPython is an implementation of the Python dynamic language for .NET. It supports an interactive console with full dynamic compilation support and makes all .NET libraries easily available to Python programmers -- while still maintaining full compatibility with the Python language. IronPython provides a great example of how .NET languages can leverage the new dynamic language features that we added into the CLR with last year's .NET 2.0 release. For example, CLR features like "lightweight code-generation" now make it possible for a dynamic language to quickly compile and JIT source in-memory (giving you really fast code execution without ever having to generate or persist a .dll file). CLR 2.0 also now has the ability to garbage collect out JIT'd code (meaning you can quickly adapt types on the fly and not have to leak code). 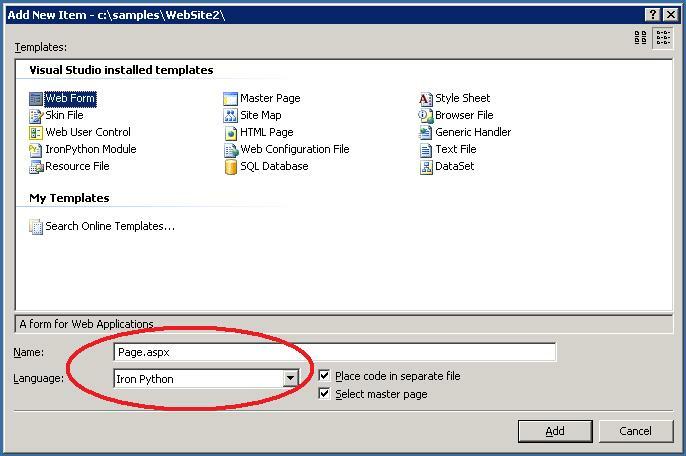 Once the IronPython for ASP.NET CTP download is installed, Visual Studio/Visual Web Developer will provide both inline code and code-behind page support for Python with ASP.NET -- with syntax highlighting, WYSIWYG designer, and full debugging support. You can also use it to create standalone python module files that live under the App_Script directory, and which can be used across a site. 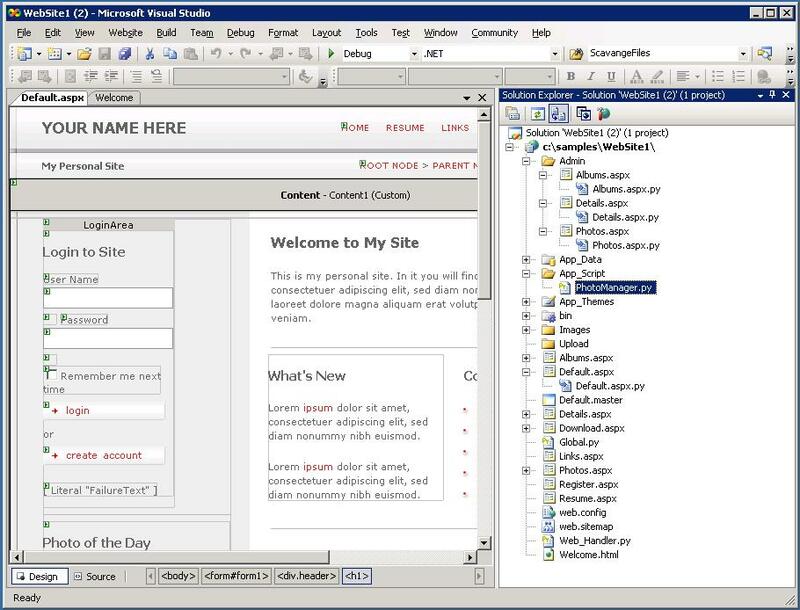 The Personal Starter Kit Python example above provides a cool way to start to learn Python, as well as take advantage of some of the dynamic language capabilities that Python provides (as well as the really nice integration within ASP.NET that the IronPython team has added). Note how you can just write "FormView1.PhotoCaption" to access the sub-control within the template, and then reference subproperties off of it directly. This technique can also be used with templated controls like DataLists, Repeaters, Wizards, etc. Pretty neat. Check out the IronPython for ASP.NET home-page to learn more about the IronPython for ASP.NET CTP download. You can also read a great whitepaper that David Ebbo wrote that describes the changes made to the ASP.NET parser to better support dynamic languages and compilation here (these can be used by both IronPython and any other dynamic language). Lastly, to learn more about IronPython itself I'd recommend watching this great videocast (with demos) that Jod Udell did with Jim Hugunin back in September. Jim codes up some cool demos on the fly, including building a calculator within WPF using IronPython that integrates with the Speech APIs. He also then shows how you can optionally refactor performance critical code from Python into strongly typed languages like C# and seamlessly work across the two. You can now use all of the same techniques with IronPython and ASP.NET. Very impressive. I like how Visual Studio can be extended this way without us having to wait for a completely new release. So do you get IntelliSense support when you access child controls this way? If so how do you do it, how can Visual Studio know what type of control it is? I hope that the kind of flexibility that IronPython offers will come to C# in the future. In the current CTP, you will not get Intellisense on child controls. This is indeed a hard problem, but I think we will be able to solve it in a future release. There's a similar thread for speeding up php interoperability. Is there any plans for a php implementation with .net support? The Phalanger project is working on adding PHP as a managed language on top of .NET. The opensource cms Umbraco (which i mentioned here before) will support IronPython scripts next major release. Seeing more products using this would be great! It is possible to use IronPython as scripting engine in signed app ? Is there a similar IronPython integration with Visual Studio for Windows applications? I believe we are going to be releasing a Windows project template soon that will enable you to use Python for Windows apps as well.